Merry Christmas (especially for some pals in NH)!! I called up a couple of old friends last night to wish them and theirs a Cool Yule...and mentioned that I have a (relatively) new music blog. They weren't aware of it yet. I told them to keep an eye on it...there'd be something special posted just for them. Isn't this cute? 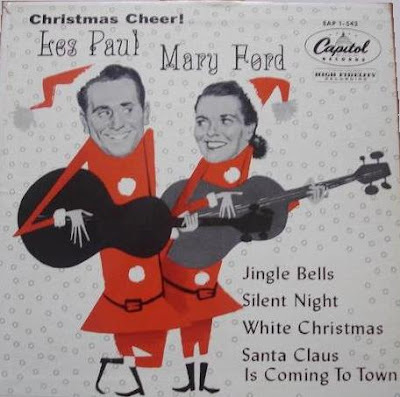 Les and Mary on a Christmas-oriented EP, issued October, 1954. I'm posting the songs in the order shown on the front cover, but, should you want to save the files, I've numbered them to play back in the order presented on the record. 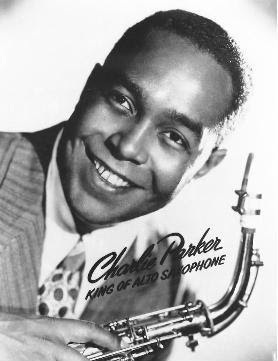 Here's another treat...the complete Christmas 1948 broadcast from the Royal Roost, featuring Charlie Parker and his Quintet. Let me rephrase that...Bird's broadcast set is complete, WMCA went back to the Roost to air Charlie Ventura's band shortly afterwards. Anyhoooo....Bird and his men are in fine spirits. Parker even is persuaded to do White Christmas! Royal Roost, NYC, Christmas 1948: Kenny Dorham, trumpet; Charlie Parker, alto sax; Al Haig, piano; Tommy Potter, bass; Max Roach, drums. Symphony Sid Torin, announcer. Now one of my favorite Christmas novelties...Jim Backus, in his Mr. Magoo voice, as Santa Claus! 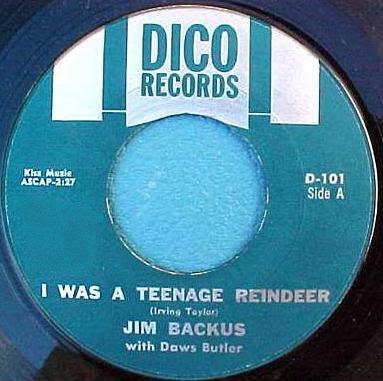 The reindeer is played by Daws Butler, doing a younger-sounding variation of his Mr. Jinks hipster character. My guess is that this was released in late 1958 or so. And, last but not least, a song that will be forever linked in my mind to birthday cake, the King of the Hill marble game (http://www.boardgamegeek.com/game/4701 for a real Blast From The Past), and hot cocoa after sledding parties (has it really been almost 40 years? 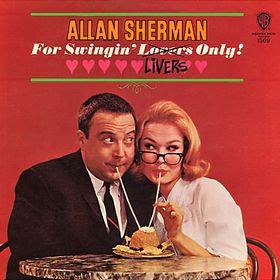 )...Allan Sherman's Twelve Gifts of Christmas. Oh...the image I snagged off the 'net (I don't have a scanner) is of the mono issue...my copy is in stereo. Nyah-nyah! ...and a Happy Holiday Season to all! It's not the most exciting record to listen to, though. That's the Jean Goldkette version of In My Merry Oldsmobile (with an all-but-inaudible Bix Beiderbecke in there) sampled at the beginning of this side. Then President Reuter delivers a pep-talk, painting a rosy picture for the upcoming year 1929 (things were rosy, all right, at least until late October!). There's a reprise of the Goldkette record...which ends abruptly...no fade. Oh...it's one-sided...with a typical Victor "spider web" on the flip. Chicago, 22 November 1928: Reuter, speech. 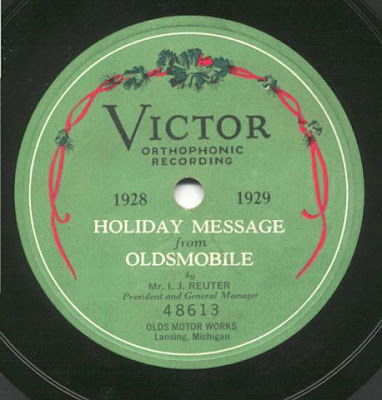 The above Victor record was given to employees of the Olds Motor Works, obviously for the 1928-29 holiday season. One can assume that the Olds company paid for the recording and pressing. Columbia made a lot of records for outside clients too, usually labeled simply "Personal Record." 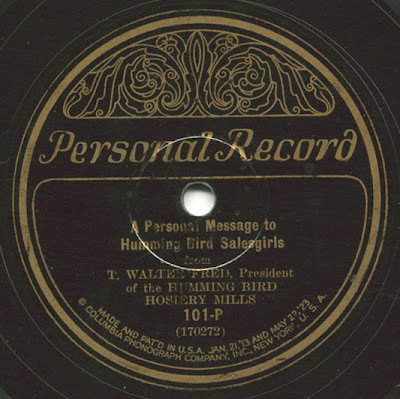 I can't find much info on the Humming Bird Mills...although the Humming Bird brand was evidently made by the Davenport Hosiery Mills, of Chattanooga Tennessee. The only info I can find about T. Walter Fred is that he lived in Lookout Mountain and that he wrote The Story of a Pair of Silk Stockings: A Hand Book for Students and a Guide for Salespeople, published in 1923. Yes, this is another somewhat dry "go, team, go" record, spiced (somewhat) by an invitation for the salesgirls to visit the mill. He notes that his factory workers are all "white folk, like you and I." Hmmmm. 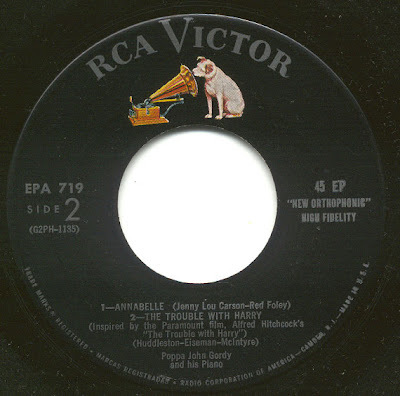 The oddest thing about the recording is that he says the the flip side is Bernie Cummins's record of Little Gypsy Sweetheart. 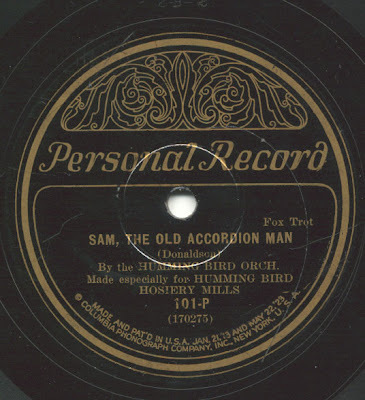 The actual flip side is the 1927 pop tune, Sam, the Old Accordion Man, credited to the Humming Bird Orchestra. It probably isn't conducted by Cummins, who didn't record for Columbia. A few colleagues with better ears than I recognized the voice of Walter Cummins on this side...so the leader of this record is his brother, Bernie. I must have had too much eggnog when I posted this. Then again, I don't have a lot of Cummins to compare it with. NYC, 6 May 1927: Bernie Cummins Orchestra; Walter Cummins, vocal. Of course, we're still wondering what became of the Cummings version of Roam On, My Little Gypsy Sweetheart that Mr. Fred mentioned on his side. Oh, I must thank The Toasters of New York and especially Taylor Bowie for supplying the correct information. We here in the Northeast have had our share of snow this week...one bad storm (around twelve inches of that fluffy stuff) and two or three annoying bouts with flurries. It was enough to inspire me to poke around in my ethnic stash, to look for music from warmer climes. And I knew I had to find the Italian Christmas side that's next. Here's an attractive label...the 1923-25 "banner" or "flag" label that Columbia used. This one has a metallic green background (which scanned a bit on the brown side. The correct shade of green is seen at the top of the label, in that deep groove). 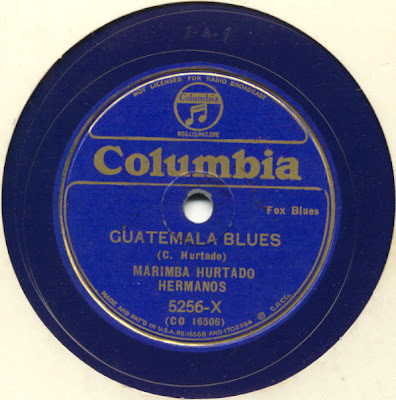 The green background was used by Columbia for miscellaneous ethnic series (They also used copper for popular, and both gold and silver for classical works. I've also seen metallic light blue and matte dark blue too.). This is obviously from an Italian series. 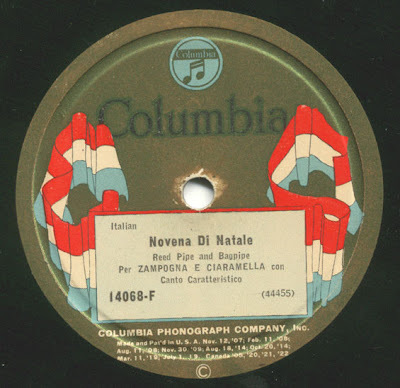 This early-1920s recording features a pair of anonymous musicians, one playing the Zampogna, or Italian bagpipes, and the Ciaramella, or reed pipe. My guess is that the latter is the vocalist as well. The music is traditionally played by the returning shepherds for the Christmas season. Sweden may not necessarily be a "warmer clime," but the prominent Hawaiian guitar on the following side certainly unthawed my cardiac cockles. Here's another rather scarce piece...an -X series (for export) Columbia, issued on their beautiful Royal Blue wax. 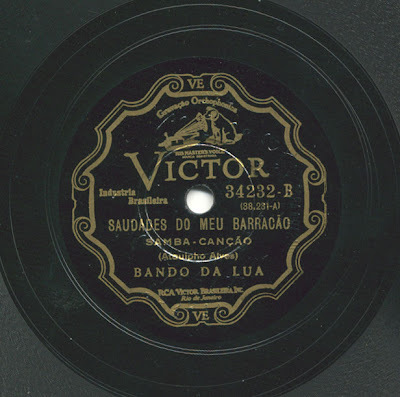 Finally, the best record I ever found at the Goodwill in East Providence, a 1937 Brazilian Victor by Carmen Miranda's backup group, Bando da Lua. Both sides are delightful...the former having some Mills Brothers-like instrument imitations, and the latter obviously about a rooster. Nice Liszt quotation in there too! That'll do it for now...thanks for listening and have a happy holiday season. 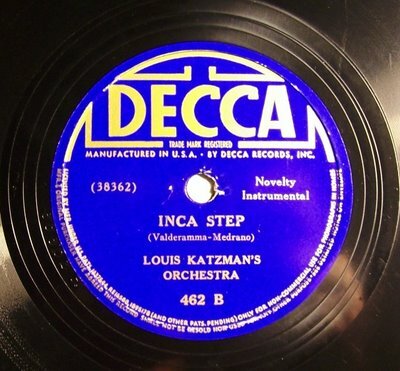 I spotted an interesting side in Lee Hartsfeld's Music You (Possibly) Won't Hear Anyplace Else blog (http://musicyouwont.blogspot.com/ ) the other day, the 1934 Decca of Louis Katzman's Orchestra playing Valderamma's Inca Step. It's a fine early example of exotica, recorded over fifteen years before Yma Sumac's Voice of the Xtabay album...and it's one of those pieces that quickly creates an "ear-worm." You'll carry it with you forever (at least it's not some awful disco record of the 1970s, right?). Welllll....here's another version of the same piece! It's a completely different arrangement, however. It's from that stash of 1929-31 Brunswick Radio discs I had the privilege of transferring recently. Although the orchestra isn't credited, it's probably Katzman again (his name showed up on another disc or two in the same stash). The announcer is Norman Brokenshire. 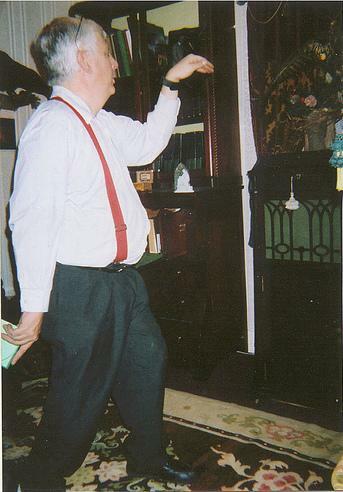 Oh...the picture was shot at a friend's house a year or so ago. Nice Edison phonograph in the background, isn't it? I was actually doing a few steps to a bizarre 1910s ethnic Columbia 78...I may get around to posting that one too. I still have to get around to posting those silly line-dance records I mentioned here a couple of months ago. Thanks to the generosity of Lee Hartsfeld, here's the Decca version! NYC 21 August 1934: Louis Katzman Orch. As promised in the last posting on Hitchcock-related records, here are three (count 'em, three!) completely different records, all called Psycho. Of course, not one of them has anything at all to do with the Hitchcock movie...but the term "psycho" became such a common figure of speech that it was only a matter of time before a song or two would show up with that word as a title. As it turns out, there were three (and I'm not counting songs like Psycho Killer or Psychotic Reaction).. The first Psycho is by Bobby Hendricks, who had a big hit in 1958 with Itchy Twitchy Feeling (he's also on The Drifters' side Drip Drop). Here Hendricks is being psychoanalyzed by WWRL (New York) disc jockey Dr. Jive (Tommy Smalls). 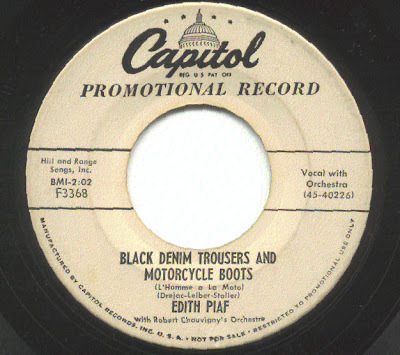 This 1960 single hit the market when the movie was new in theatres, and made it to #73 on the charts. It's definitely one of the oddest Top 100 cuts ever...and one must wonder whether Hendricks's demented babbling might have been an influence on Shirley Ellis, who had a monster hit with The Name Game in 1964. The second Psycho is a cute novelty record by Huey "Piano" Smith and the Clowns. Smith had a number of good-selling records from 1956 to 1959 for the Ace label (Rockin' Pneumonia and the Boogie Woogie Flu, Don't You Just Know It, Don't You Know Yockomo, etc. ), but Smith got ticked off by Ace owner Johnny Vincent's tampering with their recording of Sea Cruise (the original vocal was wiped off and Frankie Ford's was spliced in), so he left Ace and went to Imperial, where fellow New Orleanians Fats Domino and Smiley Lewis were doing pretty well. And Imperial was also distributing Minit records, where Allen Toussaint-produced records by Jessie Hill and Ernie K-Doe were also selling quite well too. All should have been rosy for Smith, but it wasn't to be. Imperial had their money behind Domino and Ricky Nelson, and these delightfully catchy, but fairly lightweight records didn't sell at all. They were great sides, indeed, but a fatter, funkier sound was beginning to come out of the Crescent City and these sides sank without a trace. Smith's 1961 Psycho, with Gerri Hall's bubbly vocal and humorous lyrics, actually remained unissued for quite a few years...I have it on a mid-1980s Pathe Marconi/EMI LP. The first two records were amusing. The next one is scary. Leon Payne, San Antonio songwriter (They'll Never Take Her Love From Me and Lost Highway among others) wrote Psycho between 1966 and 1968...I've heard that it was inspired by Charles Whitman's sniping attack at the University of Texas in 1966, but I've also heard that he wrote it after watching Psycho in 1968 (actually, he had to have someone describe certain scenes for him. He was blind). In any case, his version, if there ever was one, seems to remain unissued. Maybe there's a demo tape out there. Eddie Noack apparently was the first to record the song in 1968, for the K-ARK label. And the song's been covered by Jack Kittel, Elvis Costello, and several others. I think this is the most chilling version. Oh...in the final scenes of the Hitchcock movie, didja ever notice how Norman's mother's mummified face is superimposed over his own as the camera dissolves to the car being pulled out of the pond? It's so subtle...almost unnoticeable...unless you're looking for it. That'll do it for now. I think I'll take a shower bath. Of course, the shower scene has been discussed so many times that I'm not going to bother. It's probably the most-recognized musical cue from the movies. The other scene in the documentary dealt with Torn Curtain...a movie that's not all that bad, even though it's certainly not top-drawer Hitch. In the movie, there's a particularly brutal killing scene. The scene is run through twice, the way it exists now (with no music)...and then with the music that Herrman wrote. The latter was far more effective. Yet, Hitch decided to scrap Herrmann's music and go with a score by John Addison. Why? That's anybody's guess, although it appears that someone wanted there to be a hit pop record from a Hitchcock movie, or at least some lighter-sounding music, and Herrmann wouldn't (or couldn't) comply. And that's where this blog comes in...I'm going to show how the record companies tried to exploit Hitchcock films. Of course, there are several albums of Hitchcock soundtracks available now...but almost all of them came out long after the movie did. And there were a couple of LPs that Hitchcock himself was involved in...namely the Alfred Hitchcock's Music To Be Murdered By LP on Imperial by the Jeff Alexander Orchestra and his Ghost Stories for Young People LP, but that's not what I'm concerned with in this blog (but you can see/download them here http://scarstuff.blogspot.com/2006/02/alfred-hitchcock-music-to-be-murdered.html ) I'm going to play selections that have been overlooked by most of the experts...records that were issued at the same time as the movie that inspired them. I'm going to start with Spellbound, from 1945. There actually was a soundtrack album issued on 78s (ARA pressed it...and poorly, I might add...it seems the records all came out slightly off-center), but here I'm more concerned with the popular market of the day. There was a big-selling 12" Victor called Spellbound by the Al Goodman Orchestra...an adaptation of the Miklos Rosza score. 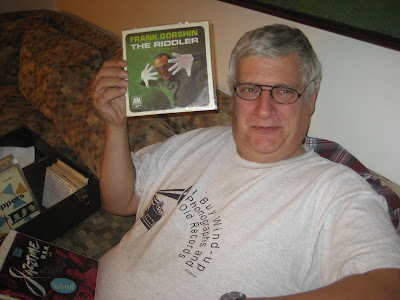 The next time a record connected to a Hitchcock movie shows up is for 1955's The Trouble With Harry...which was the first movie with Shirley MacLaine, featuring Herrmann's first score for Hitchcock. And six-year-old Jerry Mathers discovers the body of Harry. Yes, Harry's trouble is the fact that he is dead...and his body keeps getting buried, exhumed, and finally stuck in a bathtub. The movie's a dark comedy, obviously. 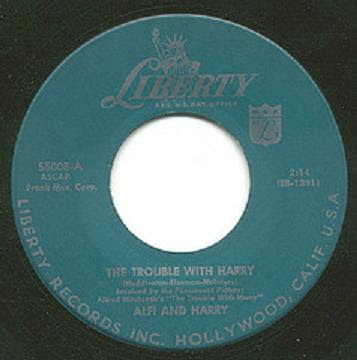 There was a cute novelty record that's labeled as being "inspired" by The Trouble With Harry. 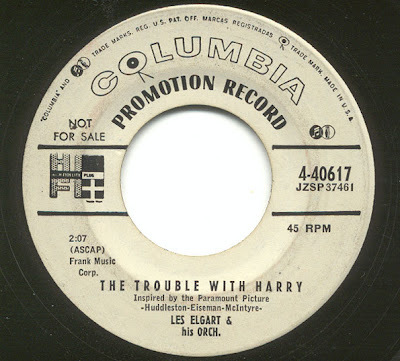 Here, Harry's a pianist who's stuck in a rut and seems incapable of playing anything other than a catchy little riff...that is Harry's trouble. He's not dead here...and there's absolutely none of Herrmann's lovely score here either. Oh...does the voice sound familiar? Imagine it yelling at a singing rodent named Alvin. Yup...it's David Seville, alias Ross Bagdasarian. This was a fairly big seller, peaking at #44 in the States and #15 in the UK. 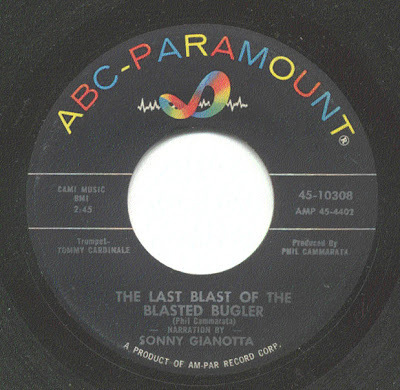 ...and this one by Poppa John Gordy, buried in an RCA Victor Extended Play 45. Hmmm....three different versions of a ditty that really has nothing at all to do with the Hitchcock movie...but all three plugging the film that "inspired" them. The next Hitchcock movie, his 1956 remake of The Man That Knew Too Much actually did have a hit single...Doris Day's record of Whatever Will Be Will Be (Que Sera Sera) hit #2 on the US charts. The Jay Livingston/Ray Evans song has become her theme song, at least for her 1968-73 CBS television show. And the song was indeed in the movie...actually, it's an important element of the plot. The record is so well known, in fact, that I'm going to skip playing it...instead. I recommend that you see the movie...it's very exciting and entertaining...and you actually see Herrmann conducting during the climactic Albert Hall scene. You might want to compare it with the Hitch's 1934 version...that one is just as entertaining, and it's a helluva lot shorter. And Peter Lorre is a memorable villain. They're both great movies. The Herrmann score for 1958's Vertigo was actually issued then on a Mercury LP at the time...one that didn't sell all that well at the time. It has been reissued several times since...I have it on CD, but I'm covering pop singles here. Bypassing 1959's North By Northwest, which has another terrific Herrmann score, but didn't generate any kind of vinyl at the time, we come to 1960's Psycho. That movie didn't generate any vinyl either, at least not intentionally (I'm imagining a Bates Motel Twist...shudder). However, the term "psycho" became part of the vernacular...and there are three very different records that have that word as their title. I'll post those next time around. 1963 was the year of The Birds, which had no real score, just bird sounds (electronically manipulated by Herrmann). 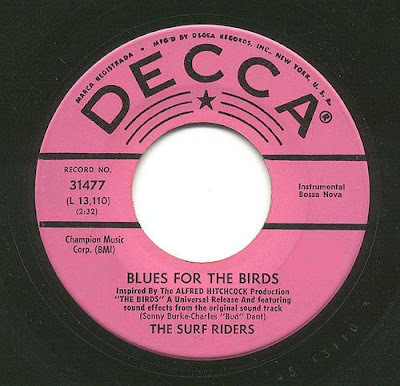 There was also a strange little 45, again "inspired" by the Hitchcock movie...a surf instrumental and a bossa-nova blues, both written by Decca staff men Bud Dant and Sonny Burke. Needless to say, this record never made a ripple on the charts. Finally, we reach 1964, and Marnie. 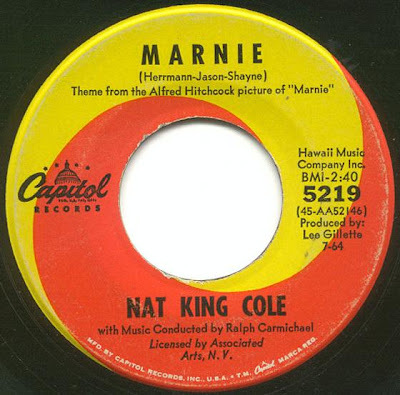 There was a rather pleasant song by Nat King Cole released then. This one's unusual, because it's probably the only time anybody tried to make a hummable pop tune out of a Herrmann melody, one that was indeed in the movie, but not sung. It's too bad that this attractive side never charted, and never showed up on any album until the compilations of the 1980s were issued. 1964: Nat King Cole, vocal; Ralph Carmichael Orchestra. ...and that's the final reel. Next time around I'll dig out those Psycho records. 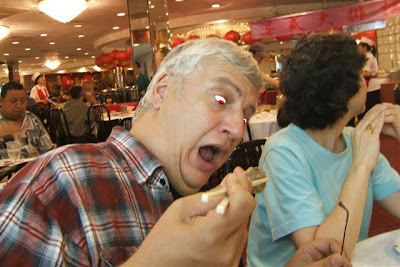 Save an aisle seat for me...I heard there's dim sum in the lobby. Finally, North Addleberry has something different, restaurant-wise...Havana Cafe. It's run by a couple of very nice folks...this posting is for them. 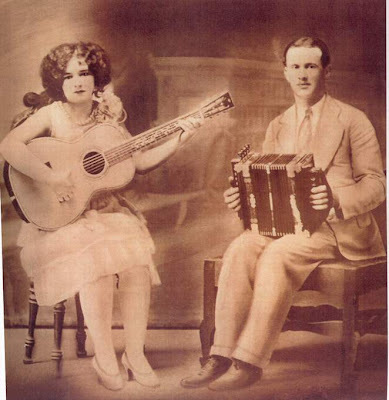 This version of Mama Inez is fairly straightforward...from the late 1920s, by the Sexteto Habañero...this is the version that's on a CD I burned for them the other day. I just got a flash from Steven Abrams, who supplied me with the recording date (28 May 1928) and the original Victor release number. Thanks, Steve! And here's the really strange version of the same song...my copy is titled Oh, Mama! It starts out as a straight rumba, but the soloists start to clown a bit...there's some bizarre laughter...and it ends up with some fairly hot jazz. NYC, 19 December 1930: Nat Shilkret, conductor; featuring (among others) Mike Mosiello, Bob Effros, trumpet; Andy Sannella, alto sax, clarinet & steel guitar. Who did the crazy laughter? I've heard it's Bob Effros. Apparently this record was also released with the (correct) title Mama Inez as well...that seems to be the more common issue. 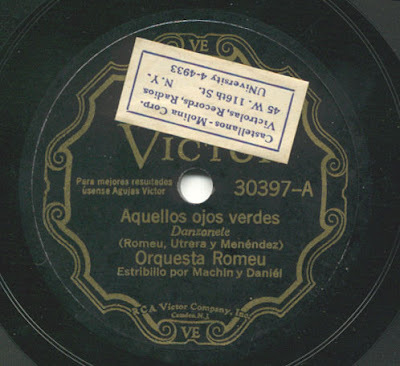 Here are a couple of other sides, also recorded in Cuba, and issued in the American Victor International Series just after WWII. Unfortunately, I have no info on these sides, but they're good. 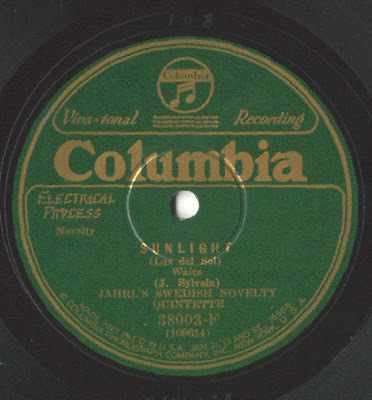 12 February 1948: vocal by Alberto Ruiz...gee...sounds like Jalousie to me. Here's another pic from our recent NYC excursion...I brought a few 45s to play before the party that night (notice the Jazztime USA EP set in my lap). The Gorshin record is rather weird...and it has a terrific picture sleeve. It's a rare one, too. That'll do it for now. Time for some flan.